Mother Nature had the night off and racing was outstanding. MARFC had a lot of things going on during this night of racing. 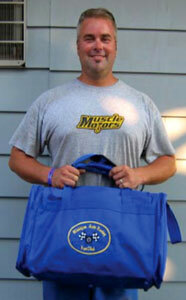 First our MARFC bag was given to Factory Stock driver # 25 Dave Christenson (right). 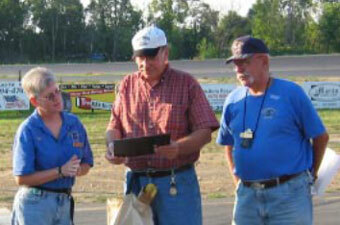 Then we presented the track with a special 50th Anniversery plaque and Sharon Fisher accepted on behalf of owner Joe DeWitte who was in a drivers meeting at the time of the presentation (left). Also the club honored long time friend and one of the great race fans to racers and fans alike Doug Long with a special apperication award. Keep up the good work Doug! Many thanks to Joe DeWitte and Greg yost for all the support and the invite to make up our rain date at their great racing facility. 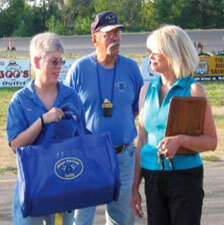 Helpers for the night were Sue Ginter, Larry & Sue Iacoboni, Fran Russo, and Tony Russo.